Are they a good team having a few bad days or a bad team that´s had a few good days? 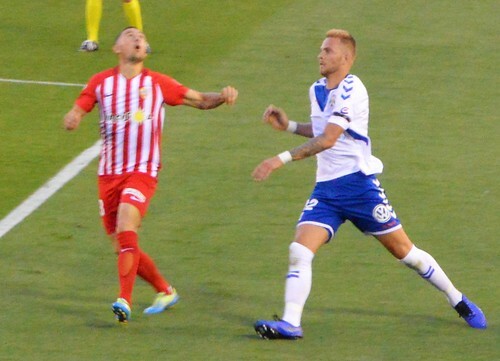 The pendulum swung in favour of the latter for CD Tenerife after a shambolic 1-3 home loss to Almeria. The previous weeks first away win for over a year should have been all the encouragement they needed to keep the improvement going. 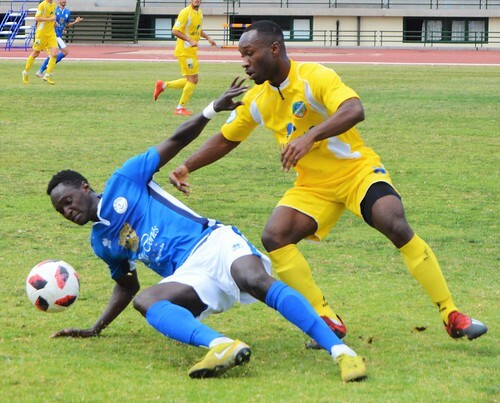 Upcoming home derby and relegation rivals La s Palmas had lost and other results aided the cause. Even the sun was shining in Santa Cruz when the tourist south moaned about Easter clouds. The scene couldn´t have been set any better. At least it took five minutes this week to leak the first goal. Rioja cut in from the left after beating Luis Perez, slipped a cross in front of goal and Gimenez managed to hook the ball into the net. That wasn´t in the script and any confidence the home side brought into the game evaporated. 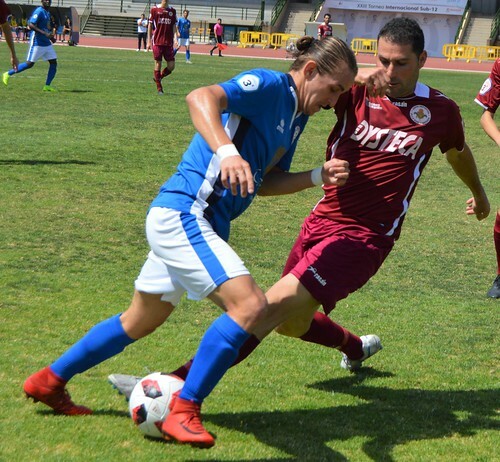 Coach Oltra´s negativity didn´t help, Racic was brought back after a suspension but he and the other creative midielder, Luis Milla, were played deep and at times were getting in each others way. Racic has only shown flashes of his January loan debut form, it has been widely reported that several big teams including an English Premier League outfit, are set to offer parent club Valencia big money to buy him in the summer. The lack of creative ideas starved the home forwards, and neither Nano or Malbasic looked inclined to fight to win the ball. 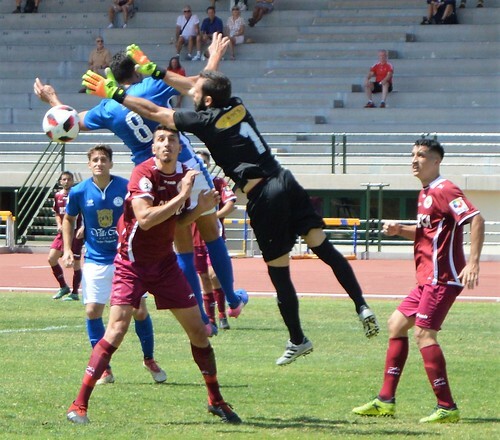 Almeria´s goalie hardly broke sweat to come out and take the ball off hesitant Nano when a half chance did arise. 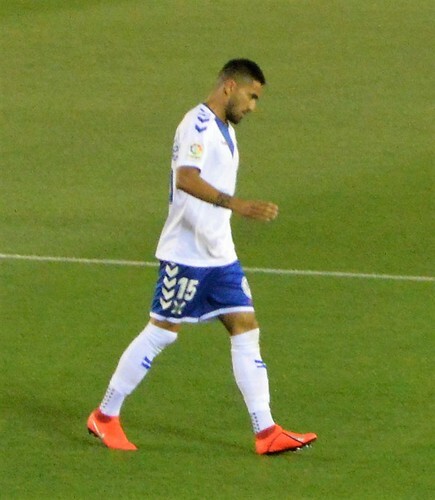 Juan Carlos Real was released by Tenerife at the end of last season and returned in new colours to torment his old team mates, he let them off the hook by putting a shot wide. At the other end Luis Milla had a penalty shout when fouled in the box, the ref wasn´t keen though. It was distressing to watch as Almeria threatened more punishment, Owona should have ended a good move with better than a shot over the bar. 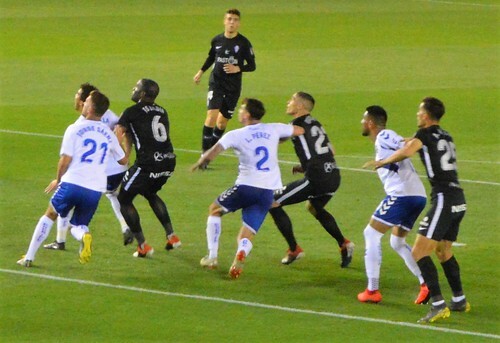 Dos Santos looked shaky at the back for Tenerife, he´s all arms and legs, a booking waiting to happen, the ref was glad to oblige. Racic managed a set up for Borja just before the break, he blasted it and the visiting goalie pushed it away. 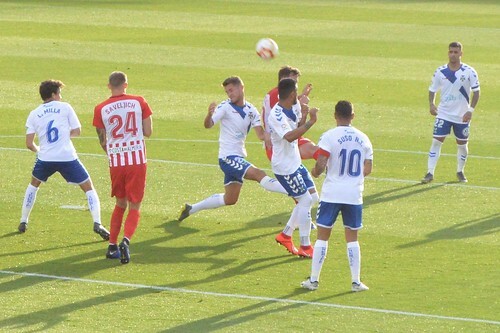 Nano looks a spent force in his second spell with his home island club, he has neither power, speed, or drive, he got sight of the Almeria just into the second half and was easily dispossessed by Owona. Centre back Jorge Saenz felt a little muscle pull and was taken off in favor of Alberto, another player whose fire has gone out. It was all in vain as Almeria increased their lead. Dani parried a shot from Saveljich but the player shaped up to net the rebound, Dani pulled him back by his foot and a penalty was awarded. Gimenez despatched it and a collective groan shook the 10,385 crowd. A couple of minutes later Rioja had an easy finish as the home defence backed off, Albert even slipped up as he tried to block the shot. So an hour gone and 0-3 down some fans started to filter out of the stadium. 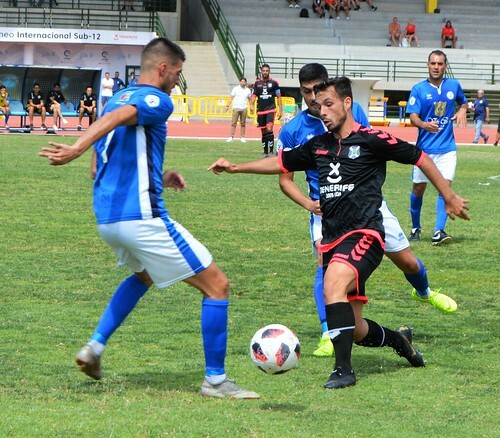 Naranjo had taken over from Borja and slipped into his comfy groove on the left, and another striker, Coniglio, tried to pep up the attack as Racic left the pitch to a mixed reception. 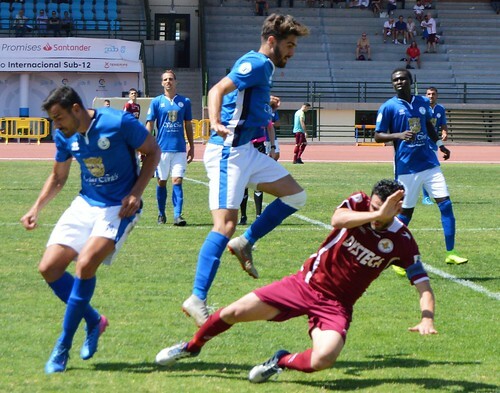 Captain Suso was having a quiet game by his busy standards but his pride drove him to push his mature legs a bit more. A neat cross from the right by the skipper found Naranjo for a tap in to reduce the deficit with 10 minutes left. 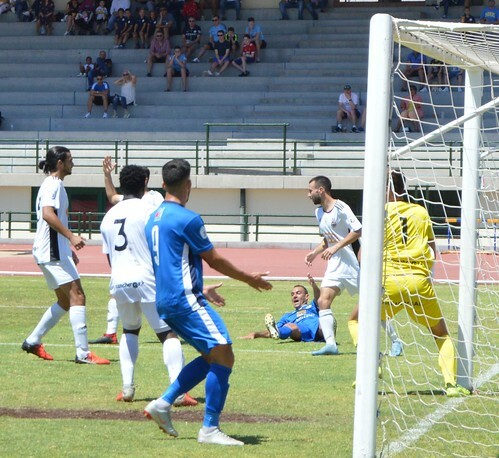 That goal raised Naranjo up to top scorer on five goals for the season, that tells its own story. There was not to be any miracle recovery, just the final whistle and the realisation that relegation is a bigger threat than ever. Tenerife are 15th just three places above the trap door, with seven games to go, and Alberto and Suso will miss the vital next game at Extremadura after bookings earned them a game suspension. The deeper the down, the higher the up. 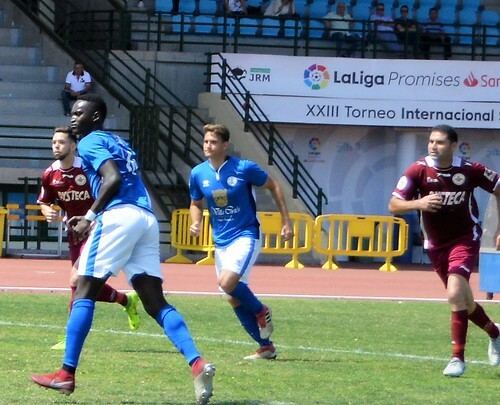 Those words would have sounded so hollow as CD Tenerife let in a first minute goal at Rayo Mahadahonda. Wind on 90 minutes and the stunning transformation was complete as Malbasic robbed the roving home goalie and cracked the ball into an open net for a 1-3 win, the first away victory in just over a year. 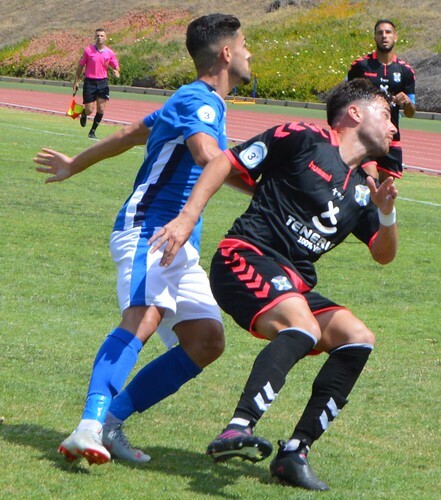 The pea in the refs whistle had barely stopped vibrating when Hector strolled past Tenerife full back Isma Lopez and launched the ball across the face of the away goal. It hit the far post and sat up invitingly for Carcelen to tap it into the net. The harmonicas were out and the away day blues were about to be played. 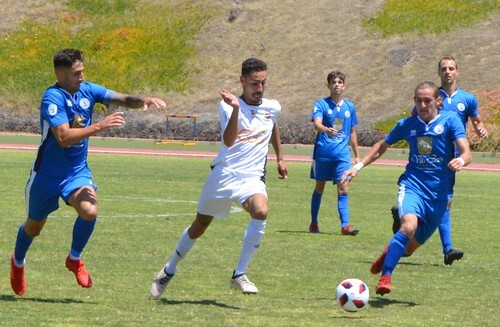 Heads could have dropped but Tenerife reacted in the best fashion against a team just above them at the wrong end of the table. Suso set up Borja Lasso who was stopped by an offside call. Luis Milla sent a screaming shot over the join of bar and post. The team from the outskirts of Madrid were riding their luck but it was not going to last. A Milla corner got a touch on from Malbasic and Nano got a foot to the ball to poke it in the home goal for a 13th minute leveller. 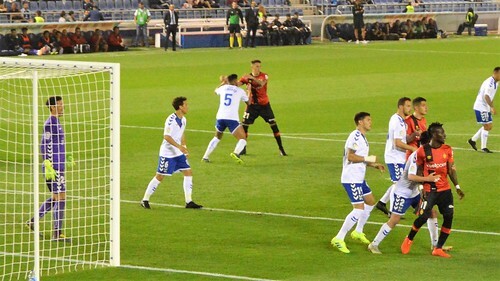 Borja was buzzing, his rising shot wasn´t that far off the target, Del Toro curled a free kick at the other end and found goalie Dani Hernandez ready to receive it. 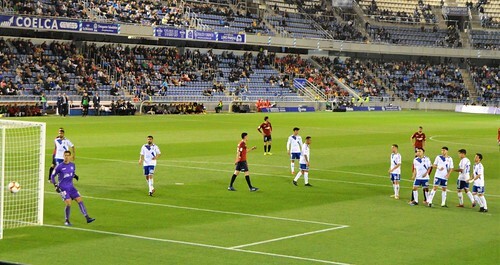 Aitor caused concern when he fired wide after the Tenerife defence failed to shut him down. 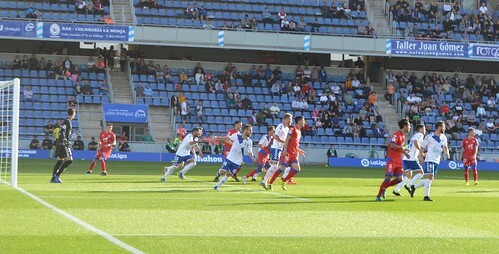 Milla hit a shot on the turn at the home keeper, Nano was offside but the moves encouraged Tenerife. The half ended with a couple of scares, Aitor dragged a shot wide, and a header was on course until Dani made a safe catch. 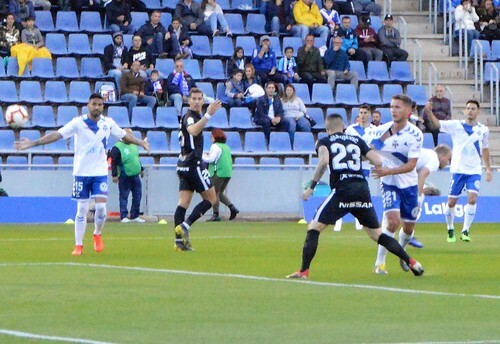 As the game resumed, Tenerife went looking for the lead, a Milla pass found defender Jorge Saenz in a good position, he picked his spot and showed the instinct of a striker to fire the ball into the net to take the lead. 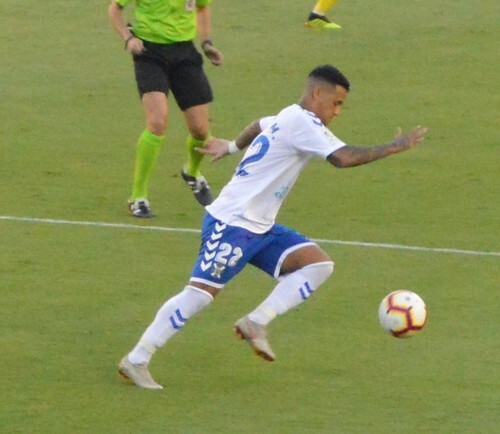 Holding onto an advantage hasn´t always worked out for Tenerife this season but Dani has been in inspired form for the last month, he showed his authority to marshal Aitor wide when he was looking to shoot. 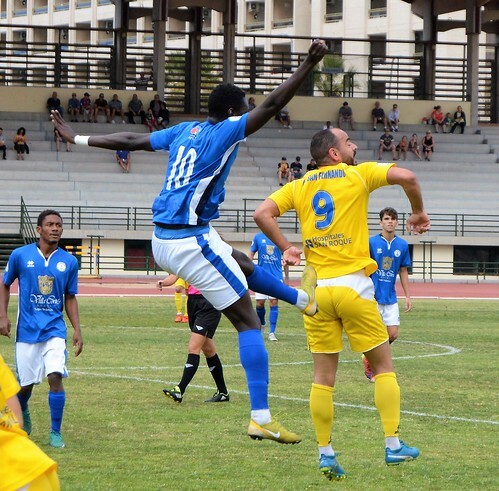 Home sub Manu offered no threat with a wild shot that pounded the tarpaulin that closed off that end of the ground. 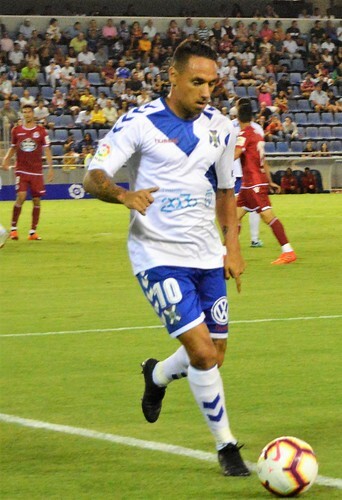 Tenerife´s first change was Naranjo for Nano, the forward put a square ball across that the defence cleared, and juggled the ball before testing the goalie with a shot. 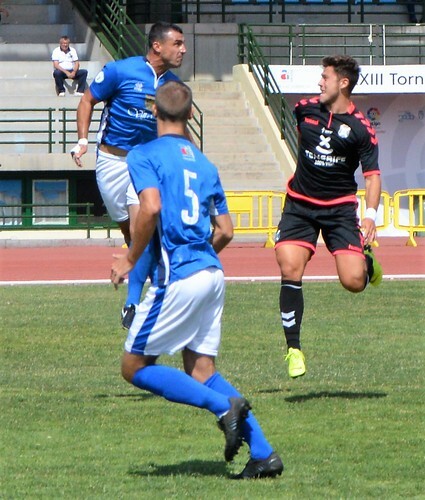 With 10 minutes left, defender Carlos Ruiz took over from Borja and it looked like Tenerife might try to sit on the lead. Varela beat Luiz Perez and let fly at Dani, his response was another accomplished save. A dipping shot could have been difficult to read, not for Dani, he added it to his tally of stops. 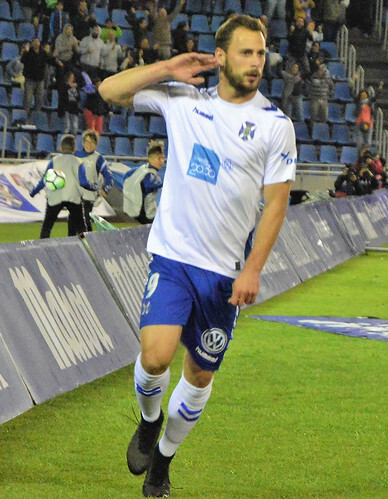 The icing on the unexpected cake was pure class from Serbian striker Malbasic. The home goalie ran out from his area to pick the ball up and completely miss read it, Malbasic raced inside him and was Mr Cool as he belted the ball into the unguarded net. There was just a couple of minutes left, Mahadahonda managed one last chance but Dani wasn´t about to show any generosity and made a point blank save. The joy of the team and coach was clear to see when the final whistle sounded, the players ran to the small wedge of travelling fans and they shared the moment. 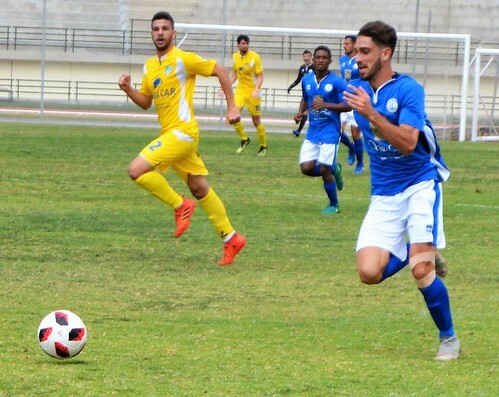 It´s a big barrier lifted on the road to salvation but other results kept the gap above the relegation zone to 4 points with 8 games remaining. 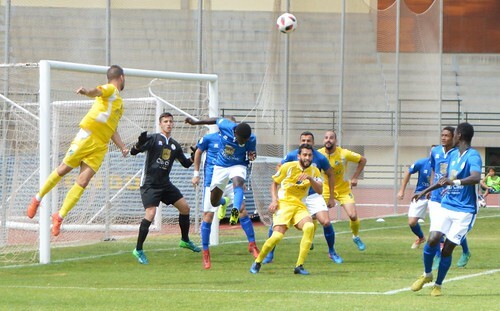 The other big incentive is Tenerife are just three points behind plummeting Las Palmas and the home derby has been set for Sat 4 May at 7.30pm. 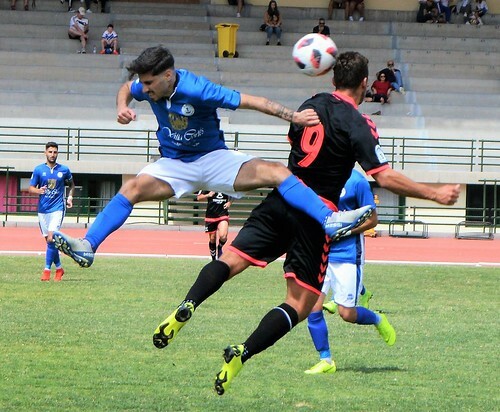 Local pride was at stake for the near neighbours in Tenerife South as UD Ibarra from El Fraile grabbed a 0-2 win at CD Marino in Playa de Las Americas after an opening onslaught. Both were playing out their season in mid table and sounded each other out in the opening minutes. Aday could find no takers to convert his swinging cross for the home blues, and Alexis was squeezed out by the Marino defence. Ibarra looked the more menacing, they were powerful going forward with Balduino eager to score against his former team. After nine minutes, a long ball free kick from Ibarra was headed on to Muny to bury past goalie Brandon. 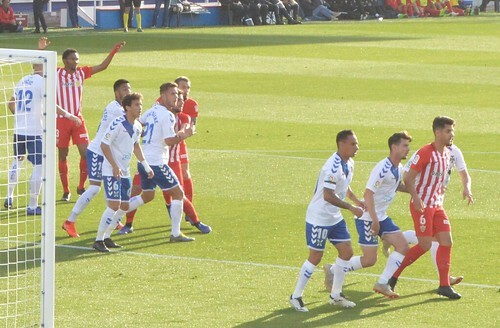 Balduino had two strong charges halted by the home defence, and a hopeful lob from distance by Alonso cleared the crossbar. Coly set Jurgen free for another crack at the Marino goal but Brandon tidied up. Pressure was building on Marino and Balduino was bearing down on goal when Saavedra stopped him in his tracks but gave away a penalty. The big striker placed his spot kick perfectly for a 20th minute 0-2 lead. It could have led to a complete collapse but Marino steadied the ship and found some better form. Javi Gonzalez gave Cicovic some work to do in the Ibarra goal as he made a speedy run. Niki raided from the right back slot and fed Javi, this time his shot teased before sneaking past the post. Marino tried again and forced a corner, Guti met it well with his head but the ball went a little too high. Ahmed was coming into the game more as he moved over to the right of the Marino attack, he beat two visiting defenders before delivering a soft shot that ran into the goalies hands. Mylan Carrasco replaced Juanmi at half time and linked well with Sesma to produce plenty of threats down the left flank. Mendy had to make a sturdy headed clearance to stop Mylan from completing a well worked move with a goal. 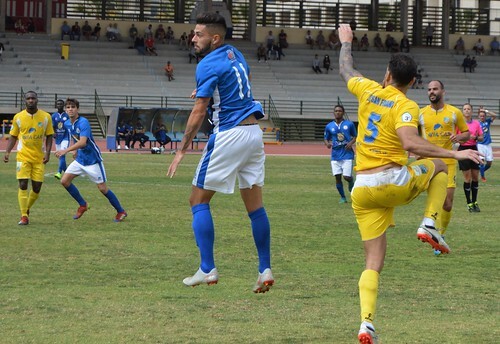 The first 20 minutes of the second half were the most promising for Marino and when Kevin Castro joined the action in place of injured Bamba they varied the play. Kevin was picking up the ball in a deep position and exposing gaps to support the forward line.The final touch was lacking, Mylan opened up the Ibarra defence out wide and slung the ball over but it was leapt on by Cicovic. Alexis tested Brandon as Ibarra emerged from Marino´s dominant spell, Alexis was the player on the end of the breakaway move that the keeper contained. Balduino was hard to hold off a he brushed past two markers and headed the ball down for a shot but it didn´t quite fall right and he wasn´t able to get a clean strike. Carballo came on for Ibarra and was another forceful player up front, Niki did well to derail him as he moved in for a strike. 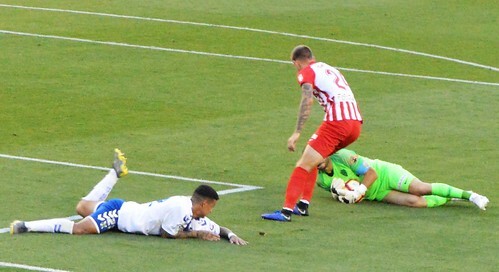 Into the last 10 minutes and Mylan lashed a shot at the visitors goal, Cicovic dived to put the ball out with a great save. From the corner the keeper followed up with a determined punch that cleared a hanging ball. By injury time the victory was safe and Muny tried his luck with a cheeky lob from the half way line that Brandon tipped over with the last touch of the game. 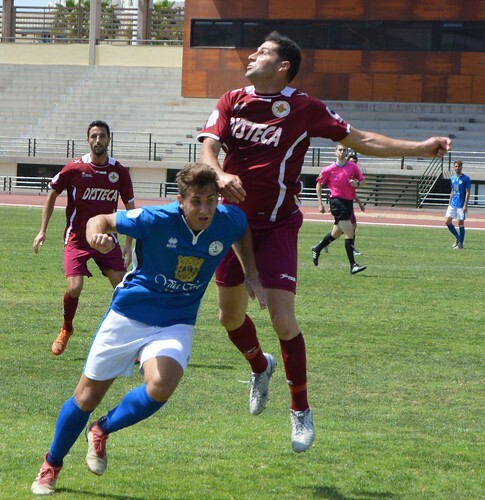 The teams are now 10th (CDM) and 11th (UDI) with five games left in the Tercera Division Group 12. 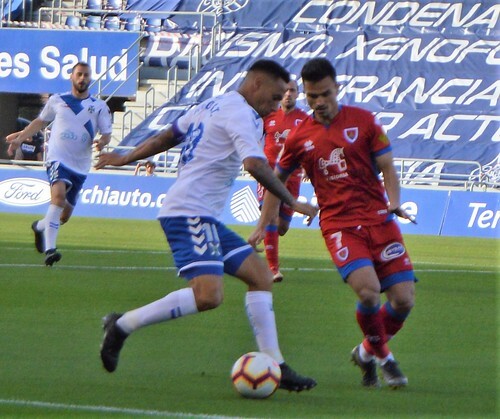 It was a 1-1 home draw with Numancia on the scoreboard, but for most of the 9,412 crowd it felt like a defeat, and a grim warning that CD Tenerife could still get pulled into the relegation mire. It was the Carnaval game but the mood was strangely subdued. The residents of Santa Cruz could be excused for feeling a little delicate after the previous days record breaking 400,000 revellers partied into the wee hours, but what was the players excuse for a pitiful performance. 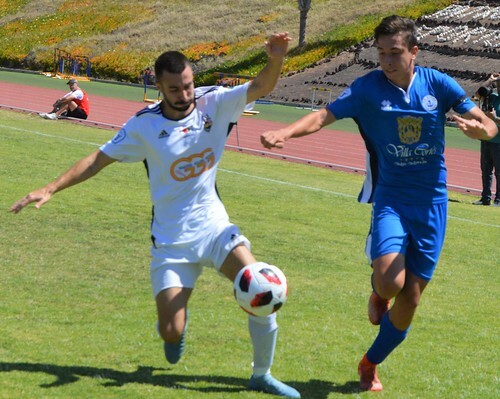 Jorge Saenz was suspended from his centre back role, January signing Mauro Dos Santos was expected to make his much delayed debut, but coach Oltra opted for Carlos Ruiz instead. The veteran defender is always a reliable option but not even using Dos Santos as a late sub added to growing doubts over Oltra´s judgement. 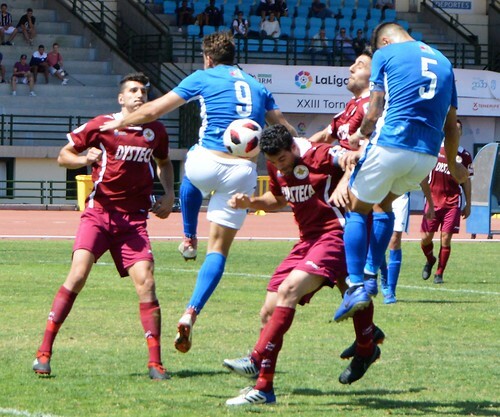 Numancia showed the greater hunger and determination for the game, a smooth build up from David Rodriguez saw an early shot covered comfortably by home keeper Dani Hernandez. That should have been the spur for Tenerife to push on and bury the game. 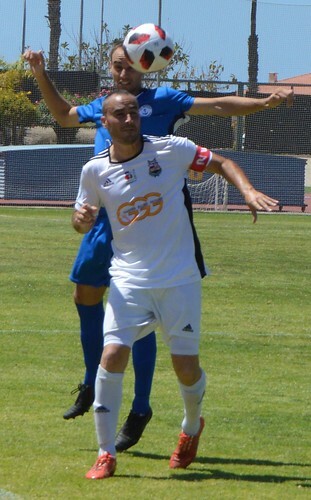 Coniglio, still looking to break his duck, managed to get up for a header but it lacked power and direction. 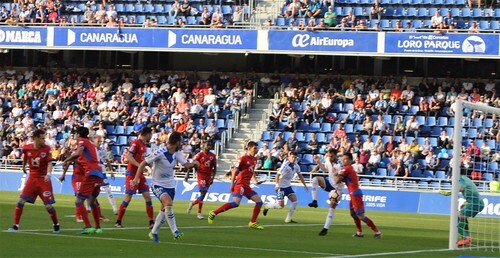 Ganea was doing well down the Numancia left wing and dropped a teasing cross into the heart of the Tenerife box, Ruiz used his experience to intercept the ball with a well timed header. Dani Hernandez has been below par recently, he showed he is still a class keeper and put on a master class that included a reflex parry just before the half time whistle. 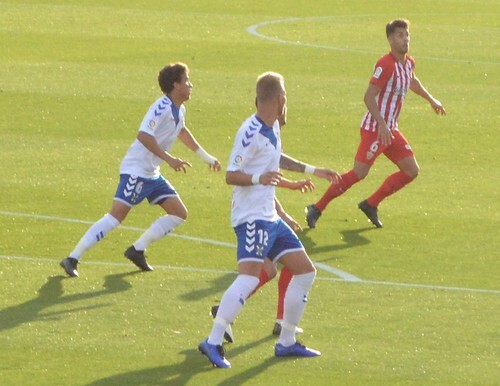 Home form this season has seen Tenerife save their best for the second half, that trend was reversed as they emerged for the second half with no purpose or drive. Even allowing for the usual sprinkler soaking of the pitch at half time, the home players had trouble keeping their footing. How can a striker as big as Malbasic become invisible? 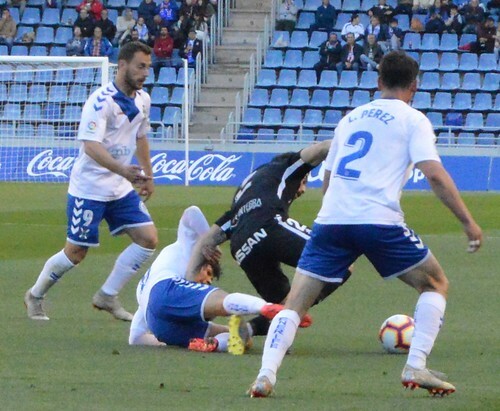 He wasn´t the only one, Borja Lasso was missing in action, Alberto continued to look uncomfortable in the centre of defence and had to be bailed out by Ruiz. 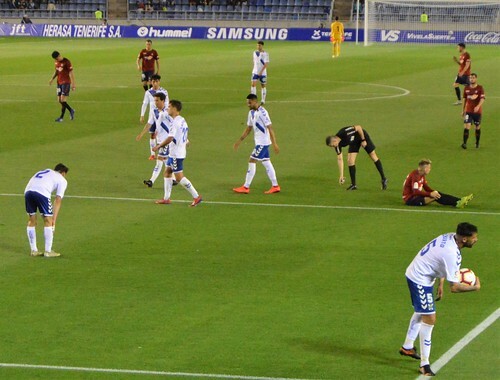 It was up to Tenerife to push for a second goal to kill the game but they looked content to sit back, Racic tried to head a loose ball away, it fell to a Numancia forward and only a sprightly dive from Dani saved his team mates blushes. 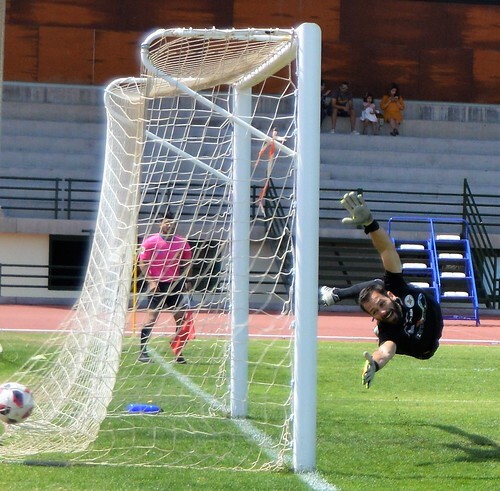 The resurgent keeper was the hero again with two saves from a corner, Numancia were well on top. 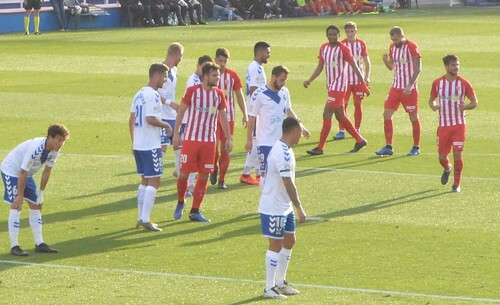 Subs are also a bone of contention for Tenerife fans, predictably the first swap came after 64 minutes, midfielder Isma Lopez on for consistently poor striker Coniglio. 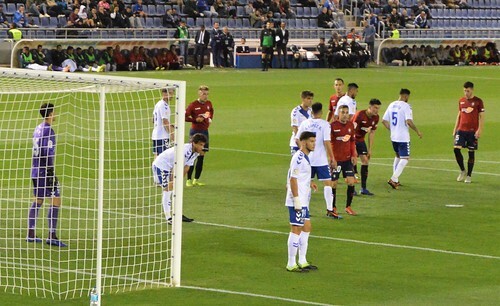 With 20 minutes left, Nano came on for Lasso, the striker doesn´t even look interested these days and his fitness level leaves a lot to be desired. The final swap was the most negative of all, the dour, defensive Undabarrena for Suso. 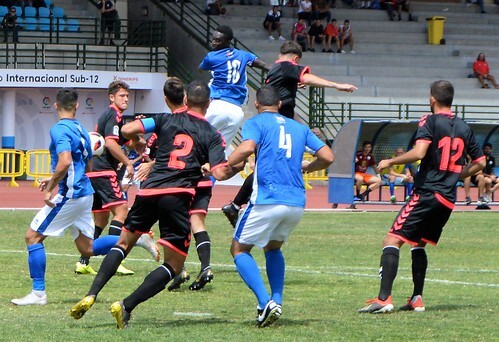 Within a minute the equaliser arrived, as Higinio scored with a free header as a cluster of defenders looked on. 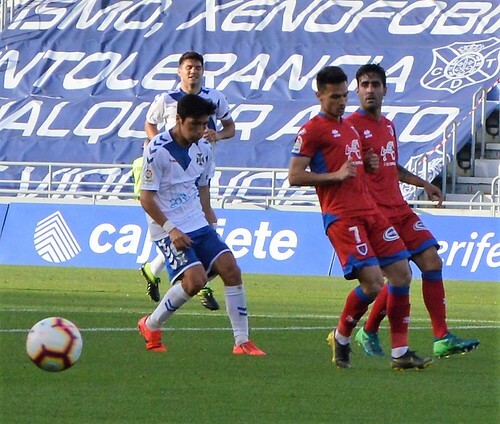 It was now all about holding on for the last six minutes, Dani blocked a Ganea shot at his near post and made an injury time stop from a last gasp Numancia onslaught. 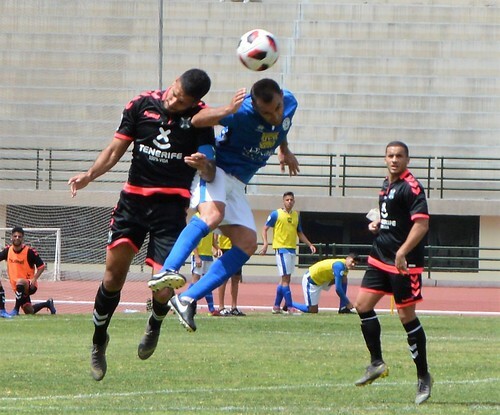 The point keeps Tenerife in 16th place but the performance was more circus than Carnaval. 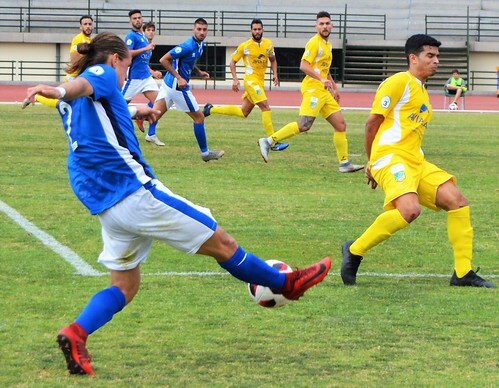 Unfamiliar faces in unusual roles was not the perfect recipe for CD Marino to take on visitors UD San Fernando from Maspalomas in Gran Canaria. Ravaged by injuries, the blues came from behind for a well earned 1-1 draw, thanks to hard work and a battling attitude. 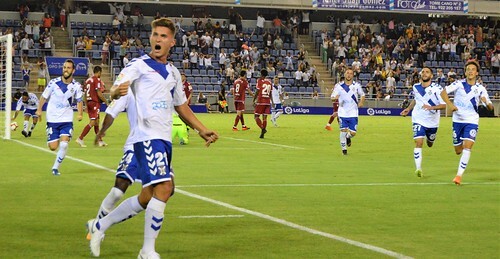 Striker Gaizka and midfielder Juanmi adapted well to filling the heart of the home defence, and Prince dipped back to help them, his early block of Fede set the tone for the resolute rear guard. Ahmed assumed extra responsibility up front, he rounded the yellows defence with ease before firing a speculative cross too high. 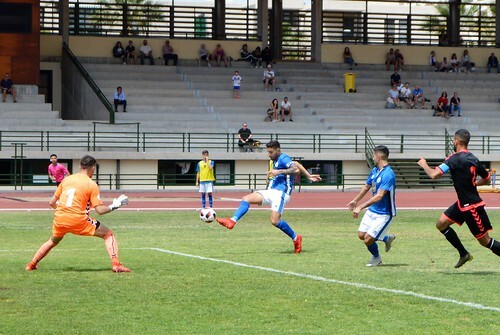 Javi Gonzalez benefitted from a long ball in, he leapt well to head the ball but it went straight to goalie Choolani. 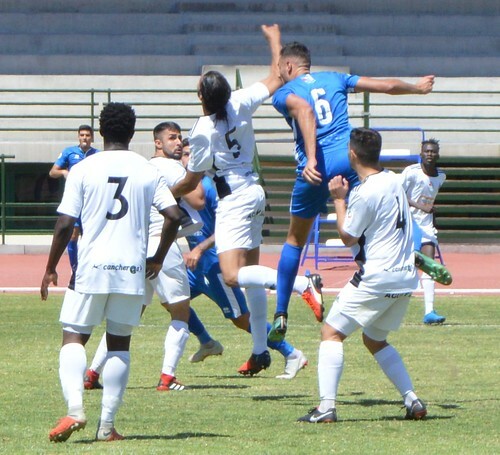 There was a let off at the other end when Brandon only half stopped a San Fernando shot, the ball squirmed loose but trickled harmlessly out of danger as forwards rushed to reach it. 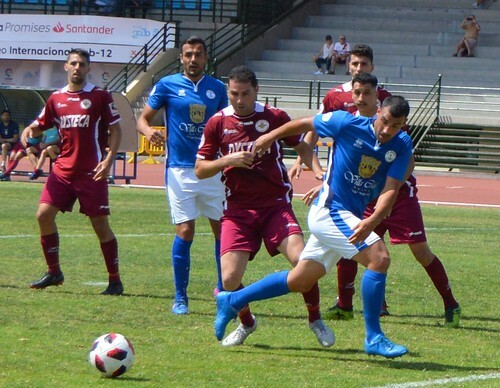 Much of San Fernando´s play was made down their left with Medina, when he cut inside he looked certain to try his luck but Gaizka shielded the ball well. The yellows tried to exploit the hastily refashioned home line up, Echedey wasted a free kick by curling the ball over the bar, and Niki came to the rescue to halt another Medina raid. Marino were giving away too many fouls and it cost them after 20 minutes when Navas powered a free kick to the left of a static Brandon to take the lead. Marino had to weather a prolonged spell of pressure that saw Bryan and Ramirez spurn good chances. 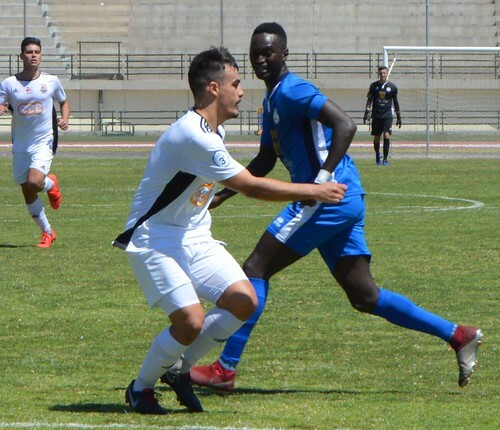 The blues regained their composure and started to trouble their guests again, Bamba showed good vision when he tried to lob Choolani from distance, the keeper was relieved to pluck the ball under control. San Fernando dug themselves a big hole when Ramirez brought down Mylan as he raced clear towards the goal. The ref didn´t hesitate to wave the red card to reduce them to 10 men. It was a handy bit of encouragement for Marino, and just before half time they seized an equaliser. 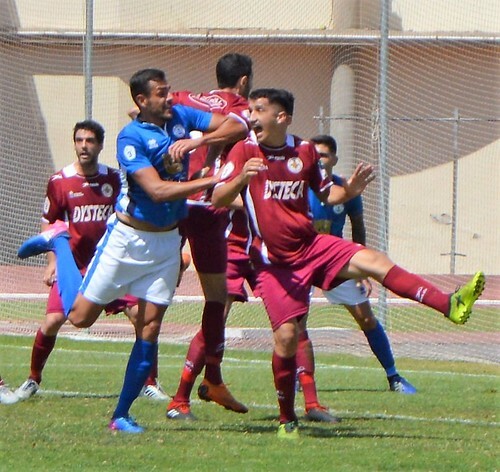 A free kick into the yellows defence caught the goalie off guard, he prodded the ball a few feet in front of him and then got tangled up with his captain, Israel. 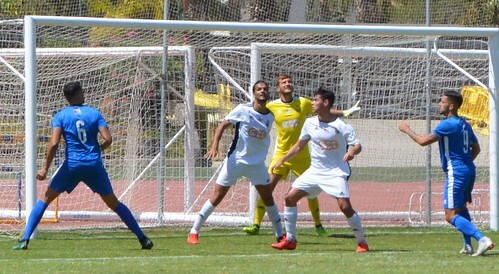 As they fumbled around, Javi Gonzalez was quick witted and tapped the ball in the net. Marino should have turned the screw at the start of the second half but San Fernando made a spirited reply. Brandon had to be alert and decisive to thwart a Bryan shot, and then claimed the ball off the head of sub Quintero. 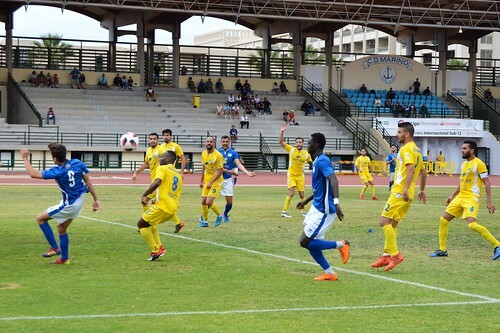 The Gran Canarian side were getting some mileage out of pushing up their full backs but Marino put the squeeze on them to dry up that supply. Numbers were evened out after 78 minutes when Navas got into an attacking position but was brought down by Gaizka just outside the penalty area. The ref brandished another red card but Fede could only muster a weak free kick that Marino easily cleared. Samuel added his speedy runs from left back to the home attack, he set up Ahmed for a shot that cleared the bar. Ideally Marino would have made a couple of earlier substitutions but the current shortage of experienced players on the bench limited their options. Mussa came on for Javi with barely 10 minutes left and Marino had a couple of half chances. 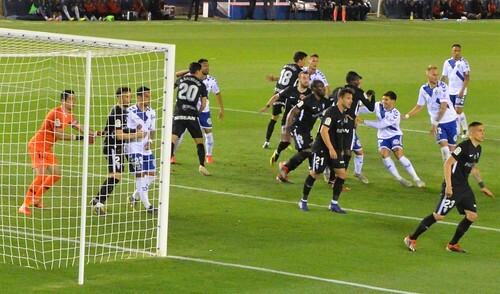 There was always a danger that San Fernando might grab a winner, Quintero forced a corner and the ball in had to be cleared off the home goal line by a Juanmi header. 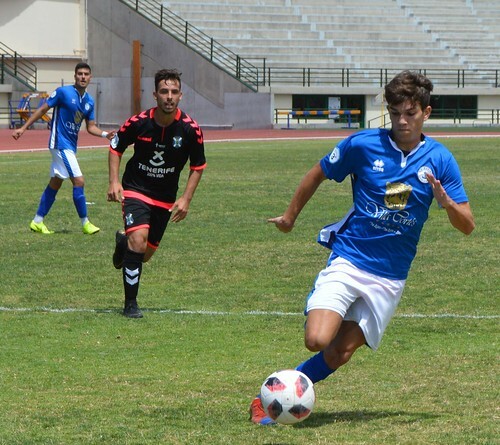 A draw was a fair outcome and Marino learned a lot about how versatile their players are, but they will be glad to have a full squad available again. His keys, his wallet, or his mobile. Jose Luis Oltra may forget them all at some time in his life, but he will never forget his 150th game as coach of CD Tenerife. 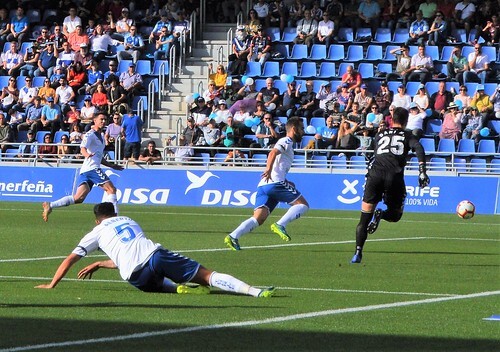 It must have been purgatory as his team slipped to a 0-2 home deficit against Mallorca and 462 minutes without a goal. Thankfully Serbian midfielder Racic became his friend for life by belting a 71st minute lifeline goal to set them on the road to a 2-2 draw. All the old problems were present and incorrect in the first half, poor passing, little support for each other, and woeful finishing. Borja Lasso in a more forward role fired an early chance straight at goalie Reina. 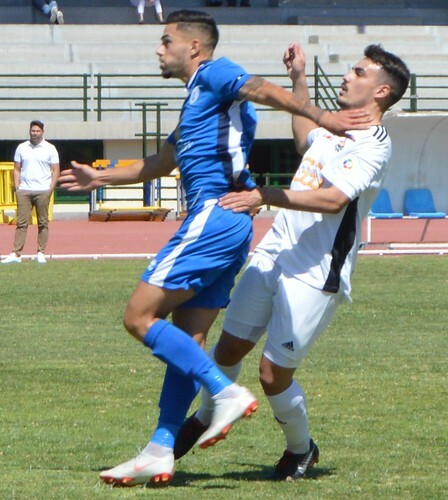 The suspension of Jose Naranjo gave Coniglio a starting chance, the Argentinian striker again looked totally out of his depth, he has neither speed, power, or positional awareness. 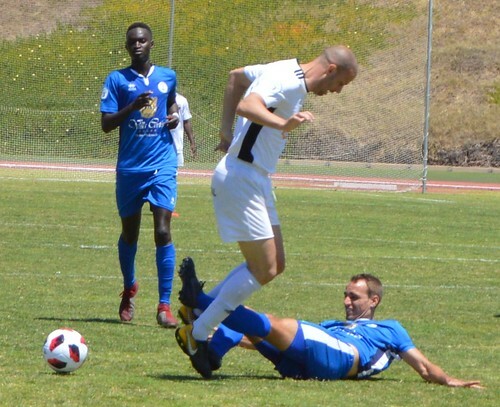 Malbasic was left to offer his brand of hard work and determination, Mallorca defender Valjent made it tough for him and his team mates. 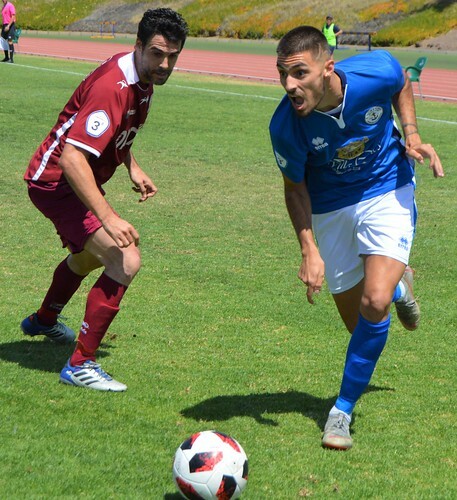 The visiting promotion candidates were a sharp side, after 14 minutes Lago Junior brought the ball under control with his back to the goal line and popped a pass out to Estupinan who cracked a fierce shot beyond Dani Hernandez and into the bottom corner of the goal to take the lead. 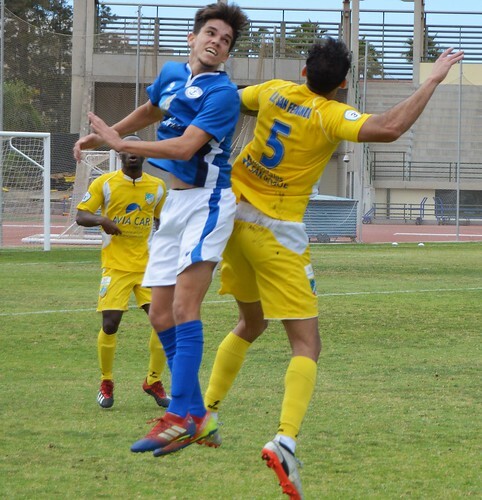 Tenerife´s best weapon was Racic, always in the action and ready to chance a shot. A corner gave him the chance to launch a strong header but the keeper took it well and punched away another header soon after. 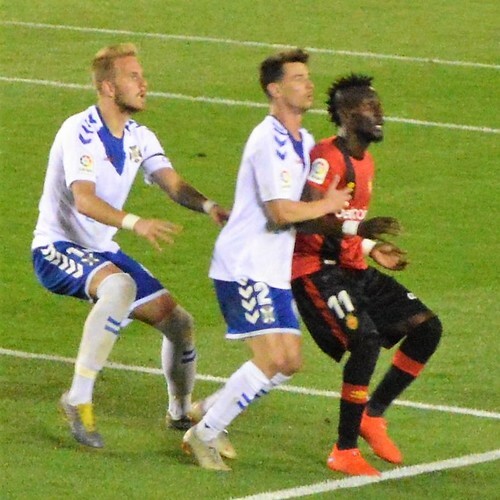 It was already looking an uphill task for Tenerife, Malbasic needed some support as he had a good go at beating three defenders who crowded round him. Just before the break, defender Jorge Saenz got booked to signal a suspension for the next game, it would be a bleak half time dressing room. 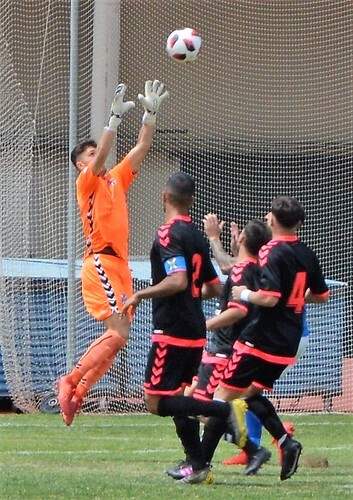 Dani Hernandez had received plenty of criticism in the week for his latest goal keeping error, it reached a new low just after the restart. A harmless ball came towards Dani who had time to cover it but he slipped and missed it, leaving a gift for Budimir to tap in. It was a schoolboy error to increase the pressure on the the teams saviour of so many games. 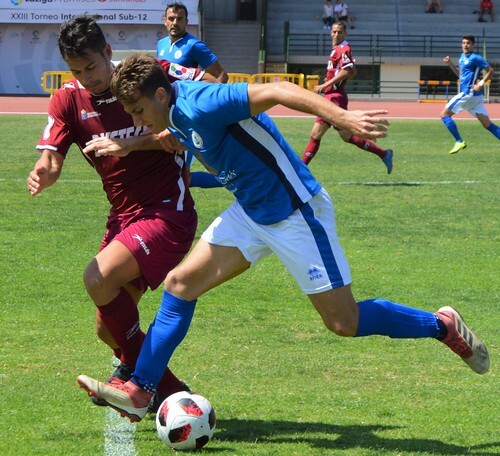 A huge reaction and show of character was needed and to their credit Tenerife set about clawing their way back into the game. 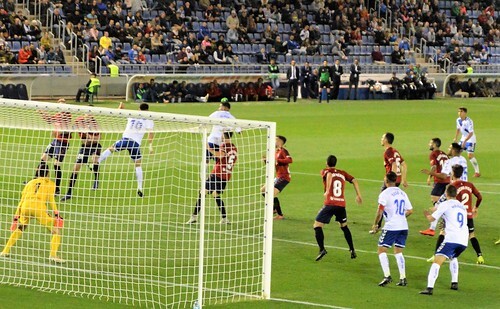 A determined break opened the Mallorca defence but Malbasic´s shot came back off the underside of the bar. Lago Junior threatened again, Luis Perez was quick to intercept his shot and Dani seized on the loose ball. Nano, back from another injury, made his entrance after 62 minutes as Coniglio departed. The striker showed glimpses of his old form when he emerged from the youth programme, it gave encouragement to the home cause. 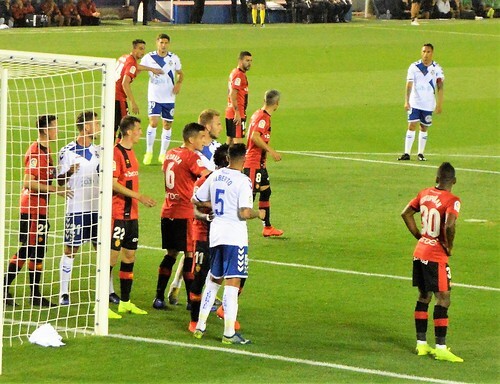 It was Mallorca´s turn to hang on as the ball pinged around their defence and they tried to close down the game with some delaying tactics. Racic deserved some reward for his efforts and it came after 71 minutes. A long free kick from Luis Milla fell kindly for the Serbian and he showed no mercy as he fired the ball into the visitors goal. 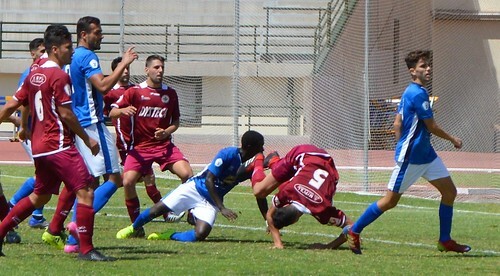 It was like a release from a curse for Tenerife, hope was in the air and the players were chasing for the equaliser. 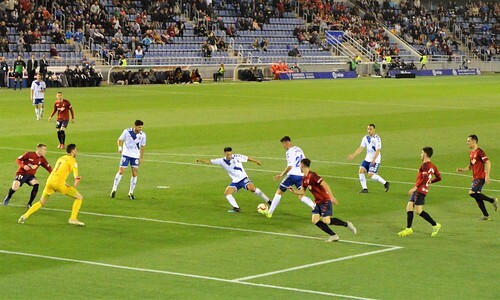 Suso added some of his trademark runs into the box from the right to the mix, and when Mallorca made a dash for the other end, Dani showed his better side with a clean take from a Lago Junior attempt. Tyronne has been seen as a strange choice of sub as the club have told him his days are numbered in Santa Cruz. Coach Oltra brought him on after 84 minutes as an adventurous replacement for defender Hector. 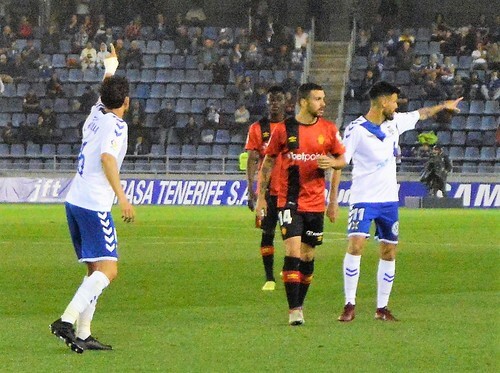 Suso was fouled near the touchline by Estupinan who was sent off by the ref, an idiot in the San Sebastian stand threw a plastic bottle, the ref noted it and got Tenerife officials to flash a warning about behaviour on the scoreboard. The club could face sanctions from the league. 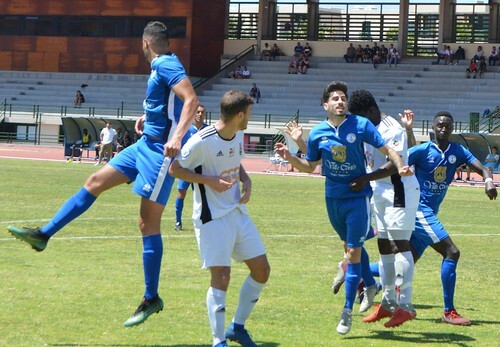 Tenerife did well to not let the incident break their resolve, and the ref did well to make sure he added on five minutes for stoppages. With two minutes of the added time used, Tyronne headed an incoming ball down to his feet and unleashed his shot to tie the game. 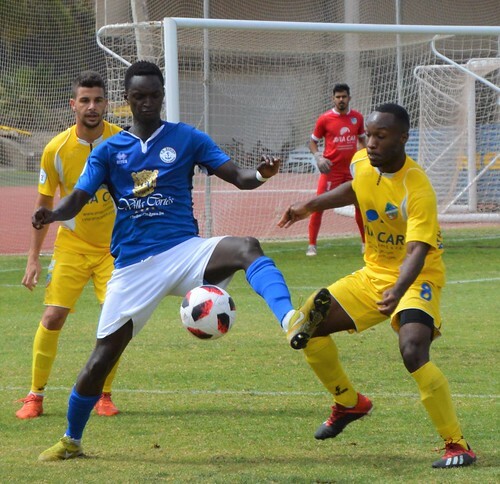 The point leaves Tenerife in 17th place and with an awarded 0-1 win at financially sunk Reus to come, they can rest a little easier in their two week gap before the Carnaval game at home to Numancia on Sunday 10th March at 5pm.